You are here: Home / Brazilian Jiu-Jitsu / What is good posture? These images imply that posture is a fixed and static arrangement of the body. 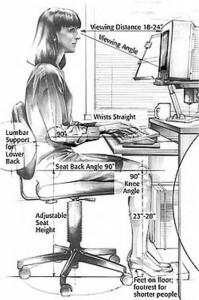 The above postures, while ideal for standing upright or sitting at a computer desk, don’t necessarily apply to the movements we make while doing BJJ. Todd Hargrove discusses the three essential elements of good posture. Let’s look at how they apply to BJJ. It is more energy efficient to use our skeletal system to maintain our posture than our muscular system. The more we use our muscular system, the faster we consume our energy. Compare the posture of the passers inside closed guard in the following two examples. The first image illustrates good, relaxed posture. The spine is straight (but not vertical) and the head is well aligned with the spine. The second images shows that the passer is markedly more tense. His spine is more vertical and his neck is bent forwards and upwards. When inside the closed guard, load is applied to the lower back of the passer by the guard player’s calves. The first passer is not fighting against this load by allowing his spine to tilt forward. The second passer is attempting to maintain a vertical spine position and the obviously tense muscles show that he is wasting energy to achieve this (unnecessary) posture. A vertical spine is efficient when the body is unloaded. However, this body is rarely unloaded while doing BJJ. Good spine angle is a compromise between minimising the effort of carrying a load and maintaining mobility. Posture does not mean being still. Mobility is vital in BJJ. A good posture is one that allows you to move. The more freedom you have to move, the better the posture. Examine the two passers below. The right hand and right shin/foot of each passer has been immobilised by their respective opponents. Look at the mobility of the rest of their bodies. The straight right arm and legs of the first passer limit his ability to move. This is a self imposed limitation as he has chosen the posture of high hips and straight legs. Compare this with the posture of the second passer. The lowered hips result in bent limbs which allow a lot more movement. A good posture is one that allows movement. A bent limb allows flexion and extension. This is better than a straight limb which will only allow flexion. The less your opponent can control your movement, the better your posture. In jiu-jitsu, you have the move you are prepared to make and you have the move you are forced to make in reaction to your opponent’s movement. Good posture allows you to easily make both of these moves. In the above image, the person on the left has a wider stance with feet firmly on the ground. This allows him the option of moving easily in all directions, to shoot or to pull guard. The person on the right has a narrower, more cramped stance. This restricts his ability to move and reduces his ability to move quickly. His likely action is restricted to pulling guard. Examine the above images of standing in closed guard. The first image shows a good posture for opening the guard. Note the backward lean. This good base allows the passer to react to sudden movements from the opponent in guard. The second image shows a vertical posture. While this imitates the ideal posture for unloaded standing, the centre of balance is in front of the passer and is he susceptible to being pulled forward off balance. These three elements can conflict each other. The wrestling stance prepares for the next movement but is not energy efficient. Being flat on your back under side control is energy efficient but does not allow ongoing movement (you need frames to move). Good posture is dynamic. The ideal posture for one position is often very different when compared to a different yet similiar position. Good posture is structurally strong, allows movement within the posture, and allow you to react to unexpected forces. These three elements can be at odds with each other, and the skill to having good posture is in combining these elements together. https://8020bjj.com/wp-content/uploads/2013/06/logo1.png 0 0 Dion Mendel https://8020bjj.com/wp-content/uploads/2013/06/logo1.png Dion Mendel2014-03-07 17:07:072018-01-21 16:28:21What is good posture?